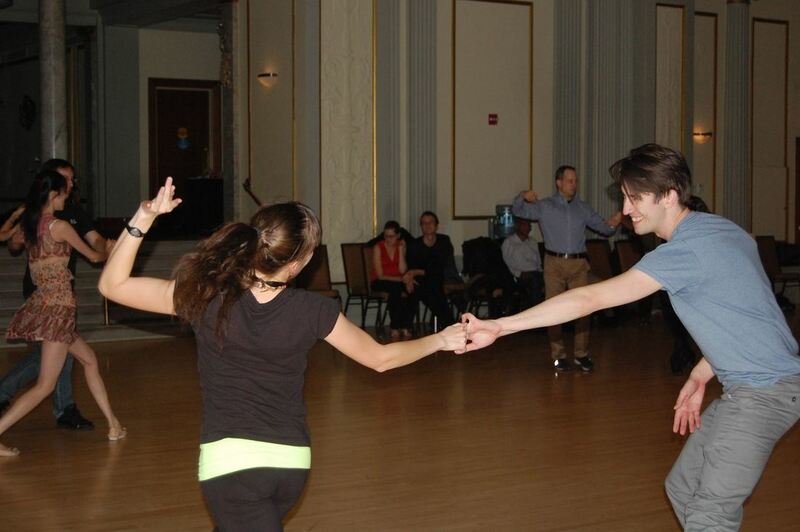 Like many things, ballroom dance has general rules regarding appropriate etiquette. Some of these rules protect the floors we dance on (and as a result, the people dancing on them), but most of them focus on how we can make everyone feel comfortable and enjoy their time on the dance floor. We encourage these guidelines in order to make dancing an enjoyable experience for everyone. Bring a different pair of shoes to wear for dancing. They do not need to be ballroom dance shoes, but you shouldn't wear the same shoes on the dance floor that you wore to get there. This helps to prevent damaging the floor with tracked-in dirt and grime. It also helps to avoid creating slippery surfaces that may cause dancers to trip or slide. No dance wax, please. Though this may sound pretty obvious, please remember to shower, brush your teeth, wear deodorant, and avoid raw onions and garlic for dinner when planning to attend a dance, lesson, or workshop. Washing your hands regularly is a good idea as well. When we dance we are in close physical proximity with others-- and if we ever want to dance with those people again we should observe the basic rules of personal hygiene. Even though most BAM dances are casual, wearing clean casual clothes will certainly help you make a better impression on others. If you happen to sweat a lot, bring an extra shirt to wear in case your first one gets gross. It's up to you to decide whether bringing several extra shirts will be necessary. Good leading comes from moving one's own body. Good following comes from responding to the movements of the leader. Doing either requires holding a good frame, but neither involves forcefulness or pain. Furthermore, at no time should you feel like your personal space is being invaded. If someone asks you to dance, say yes! The only good reasons to sit out are if you are physically exhausted, you need to get water or use the restroom, or if you are injured. If you do turn someone down, it's considered very rude to then accept an invitation to dance from someone else during that song. Also, you should seek the person you turned down and ask him/her to dance later. At social dances we are regularly put in a situation where we are asking strangers to dance. Knowing that we are in a positive and welcoming environment makes that a more comfortable proposition (especially for folks who are new to dance). "We're going to dance!" "But I don't want to!" If anyone has a history of invading your personal space, dancing too forcefully, causing you pain, monopolizing your time, or is someone who just generally bothers you for any reason, you are not obligated to accept an invitation to dance with him/her. If you would like assistance talking to such a person, find a council member--we're here to help! We can usually be found at the admission table. Experienced dancers in connection frame--very close. Hustle is danced in open frame! You may see some dancers use a very close dance position. However, not everyone is comfortable dancing so close to someone he/she might not know. Let the less experienced dancer set the appropriate distance when dancing in a closed position. An experienced dancer should always be happy to adjust to his/her partner's comfort level, so if you're new to dance, don't feel like you have to dance a certain way. As with any activity, you still get to decide what makes you comfortable. Lessons are for learning how to dance, while social dances are for dancing! It is very rude to correct someone else's dancing at a social dance, unless they ask you to. It's not fun to go to a social dance and be told you're doing something wrong, so don't do that to anyone. Besides, it's possible that you could be the one doing it wrong! There are exceptions of course. If your partner specifically asks for feedback or is physically hurting you, then it's your duty to insist that he/she stops hurting you! If the way someone touches you makes you uncomfortable, you may speak up and/or stop dancing. Talk to a council member if you would like our assistance. We want everyone at BAM to be safe and have a good time! Unless you know a partner very well and have worked on lifts, drops, and other risky moves together, it is very rude and even dangerous to expect someone to be willing to perform such moves with you. Furthermore, a crowded dance floor is clearly not the safest place to attempt these moves! To avoid injuring your partner or other dancers around you, save your more adventurous moves for practices or performances. Some of the places where we dance even forbid these types of moves! There are guidelines for moving on the dance floor to prevent collisions and encourage peaceful sharing of the dance space. Traveling dances (quickstep, foxtrot, waltz, Viennese waltz, tango, samba) are danced around the edges of the floor and travel counter-clockwise in a circle or oval. 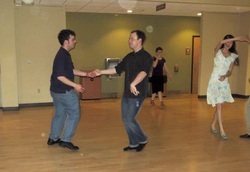 However, spot dances (swing, rumba, cha-cha, mambo, salsa, west coast swing) are danced at the center of the floor. It is possible and totally correct for some people to be dancing a foxtrot or quickstep while others are dancing a swing, for instance, so it is very important to observe this convention to avoid collisions! When doing a traveling dance, the fast lanes dance on the outside of the circle. The slow lanes dance on the inside of the circle. If you're not moving quickly, it is best to stay out of the fast lanes. You should never completely stop (and thus block traffic) during a traveling dance, regardless of where you are on the dance floor. If you are not dancing, please move off the dance floor. If you do run into another couple on the dance floor, always apologize. With a large number of dancers on the floor occasional collisions are inevitable. Furthermore, be aware that dancers of all experience levels are on the floor at the same time. The more experienced dancers accept the responsibility for any collisions, since they ought to have better floorcraft. Regardless of fault, always apologize. It's the courteous thing to do. Dancing should be comfortable and polite. Be aware of how your actions affect your partner. Be aware of how your movements affect other people, and be courteous of their space.